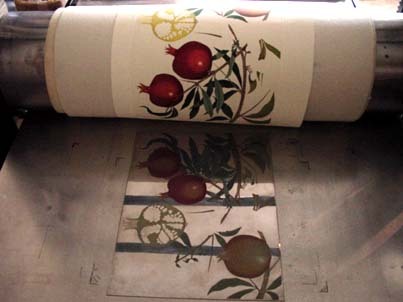 The etching process dates from the 16th century, and no photographic aids are used. The artist draws through a resin resist (which is impervious to acid) on to a copper plate with an etching needle. The plate is then immersed in ferric chloride acid so that it is etched along the needle lines. This etched linear drawing provides the foundation for all plates. 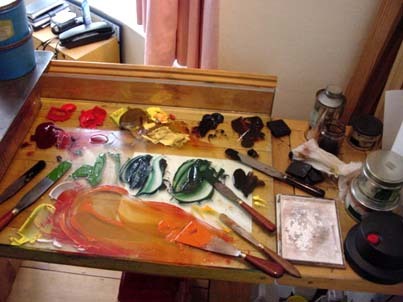 The five other stages in the making of the plate involve aquatint, spit-bite aquatint, soft ground, oil of spike lavender and sugar lift, in varying degrees. Final highlights are then achieved by burnishing back into the surface of the plate exposing the linear structure of the image. 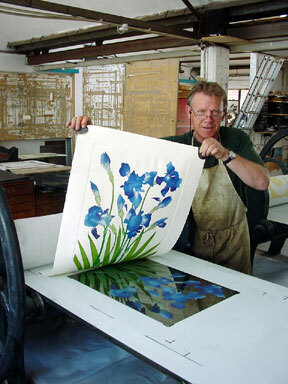 The plates are then inked in four to seven colours and hand printed on to acid-free paper in an intaglio press. Hand colouring in water colour is completed once the prints are dry. These plates were made at Ormond Road Print Studio in collaboration with Stella Whalley BA, MA. They are editioned at Hope Sufferance Press by Simon Marsh, Peter Kosowicz and Richard Gee.